WHEN YOU LOG INTO YOUR CREATOR ACCOUNT YOU CAN CLICK THE “PITCH ACTIVITY” LINK ON THE MENU BAR TO SEE A COMPLETE RECORD OF EVERY COMPANY THAT HAS VIEWED YOUR PITCH PAGE BY THE TIME AND DATE. TRACKING PITCH ACTIVITY IS AN EFFECTIVE WAY TO HELP YOU DISCOVER WAYS YOU CAN IMPROVE YOUR EXECUTIVE ENGAGEMENT. 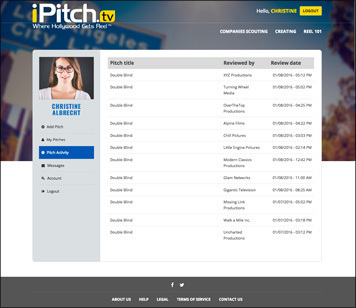 YOU CAN MODIFY YOUR LOGLINE, ADD/CHANGE A PITCH VIDEO OR ADD/CHANGE YOUR PITCH PICTURE TO SEE IF YOU GET MORE REVIEWS.